So a few weeks ago, it was a cloudy Monday before the kids started school and I was at a loss about what to cook. I knew I didn’t want to go to the store with all 4 kids in tow and I am trying to get out of the habit of running to the grocery store every day because, well…it is time consuming and expensive. Part of becoming a more seasoned cook is learning to cook something yummy with what I have on hand. I needed inspiration and when I need inspiration, I turn to Pinterest or one of my cookbooks, and usually it is one of the PW’s cookbooks. I also knew I was in the mood for something filling, tasty and utterly beautiful in its simplicity. Simple sesame noodles fit that bill. See that bowl of deliciousness? Yeah…I am going to tell you how to make your own. They are so easy. Whisk everything, except for noodles and green onions, together in a bowl. Adjust the chili oil and sugar according to taste. 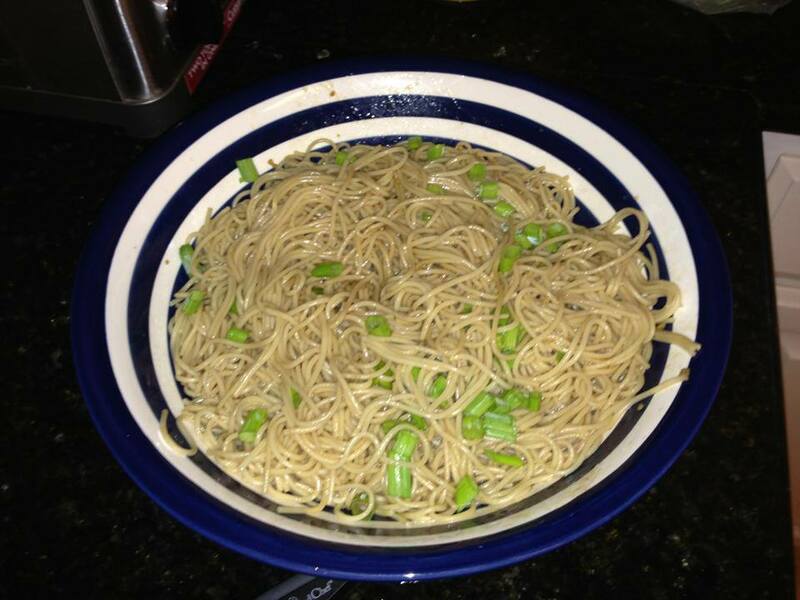 Sprinkle those diced green onions all over those deliciously coated noodles and toss. Serve them in a bowl and prepare yourself for bliss.